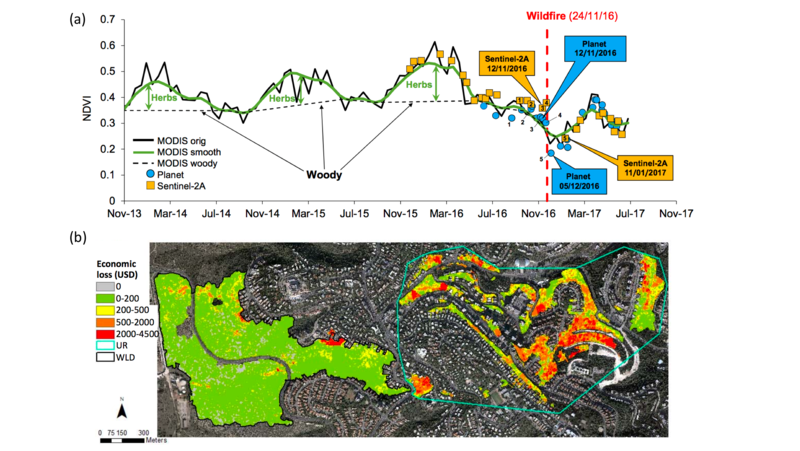 In November, 2016, Haifa, Israel experienced a fire on the Wildland-Urban Interface (WUI), causing damage to homes and other infrastructure in the urban forest landscape. The damage was visible in several Earth Observation datasets, including MODIS, Sentinel-2, and the Planet Dove constellation. Yaron Michael, in the Department of Geography and Environment at Bar-Ilan University, leveraged Planet’s Dove data to conduct a post-fire economic assessment. Michael and his team created fire severity maps from Dove imagery, which were validated at 87% overall accuracy based on field surveys. By incorporating the public value of urban trees, Michael and team concluded that the fire resulted in $41M (+/- 10) USD in damages to the urban forest. With the high spatial resolution available in Dove data, they were able to produce pixel-level damage assessment.